Century Cycles Blog: New "Define your life. Ride a bike." T-Shirts are in! New "Define your life. Ride a bike." T-Shirts are in! Our new supply of "Define your life. Ride a bike.™" t-shirts has finally arrived! Thank you to all of you who have been waiting patiently for them! Yesterday, before Doug sorted through the whole shipment, he snapped this picture to show you what a pile of 1000+ t-shirts looks like! For the ladies, we've stuck with the popular Periwinkle color, and Royal Blue and Pink for the kid's sizes. 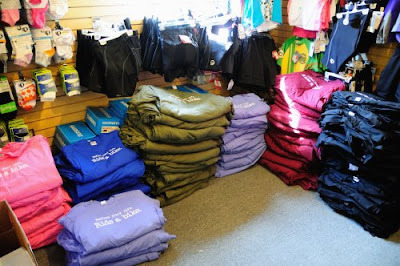 For the men, we are continuing Black and Maroon, and have added the new Army Green (see pile in the center)! As always, you get one of these t-shirts FREE with any new bike purchase, or just $9.99 each when purchased on their own! You guys should do a jersey like that. I dont think your current Century Cycles bicycle jersey has the the "define your life, ride a bike" phrase on it, do they?